Morrissey is so very good at being downright snarky. If you’re a fan of The Smiths or the Mozzer, you know what I mean — the songs can take feelings of angst or anger and turn them into sinister laughter within moments. This song, from his 1992 album Your Arsenal has always been just that kind of song for me. The album is really one of, if not, his best. It has other great tunes like “You’re Gonna Need Someone On Your Side” and the supposed love song written for someone who worked at Morrissey’s record label, entitled “You’re The One For Me, Fatty”. As for this song, it’s a tune that I’ve been humming around in my head for a couple of days now because I’ve been feeling both fortunate and, perhaps, slightly wanting to rub it in the face of my detractors. By week’s end, I know someone will be singing it and thinking about me. In the past, I could hear myself humming it when I was feeling dejected or lost. But the laughter, dear friends, is all mine today. So sing and laugh with me! La ha ha ha ha ha, ha ha ha ha ha…. 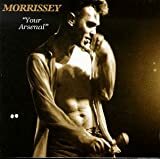 You Can Purchase Morrissey’s Your Arsenal at Amazon for $7.50 by clicking this spot.